This is the second explainer in a six-part collaboration between Ben Bovarnick (FES ’18) and Sara Harari (FES ’19, SOM ’19). The collection closely examines the barriers facing adoption of new, advanced energy technologies that can revolutionize electric-grid operations and utility business models and spark potential solutions to elicit faster transformation in this expansive industry. Let’s say you’re upgrading your phone. The time has come for a new one, you dropped it in the pool, the dog ran away with it, it was destroyed by accident, or it vanished mysteriously. You’re at the phone store and there are 13 billion options. The salesperson is trying to sell you on upgrading to a newer version of your old phone. There’s this other one that comes with Netflix on it, but who knows what the service territory is? How do you make up your mind? You can go with your gut or you can do some research. After all, you can’t invest if you don’t know what you’re getting into. The same thing is true of utility companies. From batteries to blockchain, the energy sector is enjoying a period of rapid innovation with new technologies coming to market that carry the potential to upend traditional electric infrastructure and business models. Yet electric utilities and other electricity providers have been slow to adopt these novel technologies largely because they lack the information to fully weigh their options. Meeting with utility representatives, we frequently encounter stories of vendors and developers pitching their technology to utilities with little success. It can be difficult to shoehorn advanced energy technologies into the established utility public-procurement process. Utilities want to see solutions, not science. But it’s challenging for vendors to educate utilities on new ways to solve old problems without a new way to communicate. There’s currently an understated paradigm shift in the procurement process that is revolutionizing how utilities make new investments. Utilities must reimagine how to procure the technological best fit. And integration may require technologies or strategies new to the utilities and/or unfamiliar to state regulators. Utilities face a complex task: they must ensure any integration is cost-effective and preserves system reliability while considering new and innovative solutions. On the other side of the procurement process, vendors marketing potentially innovative and disruptive energy technology can find themselves working as educators. They must teach utilities about the value their products can provide at trade shows, through pilot projects, and in stakeholder workshops. Recently, we spoke with a general manager (we’ll call him “David”) at a deregulated, investor-owned utility (we’ll call it “Alpha”). He requested to remain anonymous. He is responsible for assessing the feasibility of new advanced-energy-technology projects. The bid process for the case discussed is currently underway and he prefers identifying features remain confidential. As a manager, David analyzes new technology, develops a business case for it, and reports new opportunities to Alpha executives. Last year, he was presented with a new challenge: state legislators mandated Alpha begin exploring energy storage options. This mandate posed several concerns for Alpha. First, it was unclear if as a divested utility, Alpha would be allowed to own, operate and rate base energy storage. Because energy storage can benefit generation and distribution operations simultaneously, proposed investments can run afoul of utility regulations. Utilities may be inhibited from taking advantage of the full suite of services the technology can provide. A divested utility is prohibited by legislation from owning generation assets. Energy storage can provide electricity to the grid as a generation asset and contribute to the stability and efficiency of electric transmission and distribution services. Therefore, in deregulated markets, electric-transmission utilities may be restricted from owning electric infrastructure that is considered generation assets. Second, Alpha had very little previous experience with energy storage. The company was unfamiliar with how to appropriately value a storage system and how such a system could be implemented in the cost-effective fashion mandated by regulators. Finally, Alpha sold off all operating assets when the state was deregulated and no longer had the in-house expertise to operate them. David faced a conundrum: how could he appropriately present the business case or begin the procurement process with so many unknowns? To appreciate the challenges David faced, it’s important to understand the traditional procurement process and how it’s changing. When a utility identifies the potential for future grid deficiencies within its territory, it has several options to address the problem. The first is to design a solution internally, based on in-house expertise, and issue a Request for Proposals (RFP). For small or simple projects, a utility could build and deploy system assets with in-house teams and construction crews. If the utility is lacking in-house expertise or is exploring alternative options, it may issue a Request for Information (RFI). It’s important to clarify that a Request for Proposals (RFP) is very different from a Request for Information (RFI). These procurements may be issued publicly or sent directly to vendors. Today, utilities face new challenges to innovating in the traditional grid structure. In response to developers offering increasingly diverse energy solutions, many utilities have successfully leveraged RFIs to help pinpoint the best approaches to modern grid challenges. The rapid emergence of advanced energy technologies highlights the benefits of using RFIs as a complement to RFPs. In many instances, new technologies are emerging so quickly that vendors may be the ones best informed about how to deploy and maximize value. Utilities have begun to leverage the RFI process to gain greater insight into the opportunities and potential limitations associated with technology procurement. Responding to RFIs can be labor-intensive as each utility requires unique information about how technology can perform on their system. An RFI is a set list of questions that may or may not pertain to specific technology. Although this allows for more flexibility in responses than RFPs, technology vendors can find it difficult to convey the nuances of technology and the additional advantages their technology may provide. Vendors responding to RFIs often face an uncertain timeline and no guarantee of implementation. It’s common for utilities to issue RFIs and then decide not to move forward in the procurement process. Instead, the storage providers we interviewed prefer one-on-one conversations, workshops and conferences to educate utilities. They said this is preferable to the formal procurement process. Although the RFI process is still limited, this process can help socialize advanced energy technology as well as new business strategies for utilities. RFIs offer technology vendors and advocates one path for influencing utility planning and investment decisions in the future. Let’s come back to David at Alpha. David identified a substation that was scheduled for upgrade that could be avoided or at least deferred with the installation of a storage system. However, faced with unfamiliarity about implementation of an energy storage system, potential ancillary benefits, and unknown costs, David was unable to write a sufficiently detailed RFP. Instead, Alpha issued an RFI detailing typical use cases and asked potential bidders for their opinions. Which type of system was best suited to which use case? What would a typical lifecycle of the system be? What would it take to operate, manage and maintain the system? What would the cost of the system be? Informed by the RFI, David wrote an RFP that satisfied both regulators and Alpha’s project needs. David told us that in going straight to an RFP, Alpha would have risked missing important input from those most familiar with the technology, the vendors. At the beginning, there was some internal resistance at Alpha to this approach. After all, historically, the substation would have been upgraded for half the price of the storage system. However, in the process of developing a RFI, Alpha accumulated enough understanding to feel confident issuing a RFP for energy storage. Vendors were able to detail potential ancillary benefits that storage systems can bring. They clarified that these benefits may go beyond the traditional utility product. The RFI process provided vendors with the flexibility and opportunity to propose operational solutions rather than specific technologies. The rapid pace of technology innovation has exposed wider communication challenges at hand in this energy transition. 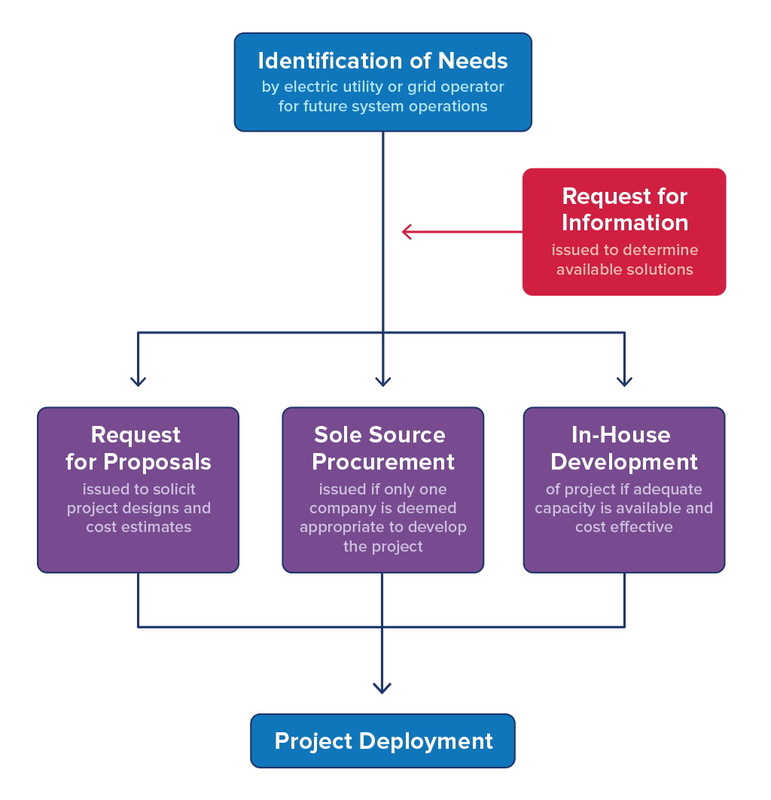 This disconnect in the procurement process exposes how information transfer on new technologies between utilities and vendors – as well as other electricity-sector stakeholders – can create a barrier to deploying advanced energy technologies. The RFI process, though far from an ideal model, offers one important tool to bring together disparate parties. In the face of continued innovation, stakeholders will need to build on the information-sharing model of RFIs and continue to optimize communication channels for future grid advancement. Please contact us directly with any comments or questions or click here to be put on a notification list for future publications in this series. Community Microgrids – A Tool for Adaptation or Mitigation?